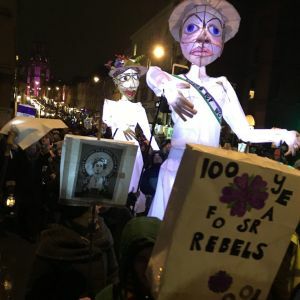 Last Tuesday on 6th February, I joined hundreds of people from across Bristol in a fantastic lantern parade from Berkeley Square, down Park Street and onto College Green, to mark 100 years since the first women were allowed to vote in Britain. Granted, only women over 30 who owned property or were graduates voting in a university constituency were added to the electoral register, following the signing of the Representation of the People Act on 6th February 1918. However, it was a start, and laid the foundations for the Equal Franchise Act ten years later, which gave all women over the age of 21 the right to vote, whether they owned property or not. The cold rain didn’t dampen the spirits of those taking part in the parade, and women from across the city participated in the colourful event, displaying the most wonderful lanterns and playing an assortment of music, including an all-female brass band and a performance from the 100 Voices girls’ choir. The pinnacle of the parade was a pair of two beautifully sculpted paper lanterns in the form of two suffragettes, proudly wearing their sashes in purple green and white.